Vegan Persimmon and Butternut Squash Soup! 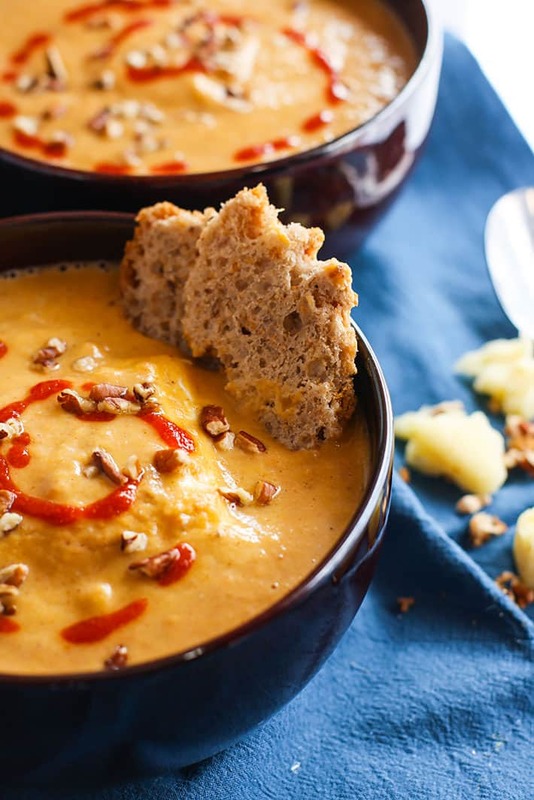 A creamy, sweet yet smokey, butternut squash soup recipe with the addition of Persimmon and it’s anti-inflammatory nutrients! Paleo, Gluten free, dairy free, and super easy to make. This is one immunity boosting delicious soup. Hello Monday! I am that person who kinda likes Monday. I know, gasp! But it just feels fresh! Monday’s have a feel good start for me. This soup will make you feel good. And it’s full of nourishment, which lately I’ve been needing to focus more on myself. You know this. Self care, very important yet often overlooked? I’m working on it. Here’s the thing. Yes, this butternut squash soup is full of nourishment, but there’s also a little something extra in here that makes it EXTRA EXTRA special. Well, there’s a lot! But I’m going to narrow it down to TWO very important things. Because it’s Monday, feeling good also means not overthinking. First – Persimmons are packed with phytonutrients, antioxidants, fiber, B Vitamins, and minerals. This little fruit is pretty amazing. Which is why it’s so great for your health and for boosting immunity! Second and more SPECIFIC – This fruit is EXTRA SPECIAL this OCTOBER month! You see, Persimmons contain a flavonol (aka an antioxidant) called Fisetin. A new study has shown that fisetin can “induce cell death in breast cancer cells without harming normal breast cells.” You know what that mean? It means that persimmons are one of a few fruits/vegetables that can help kill breast cancer cells. See, I told you persimmon is pretty amazing! source. I don’t know about you, but just reading how food can really heal and cure warms my heart! Especially since October is BREAST CANCER AWARENESS month. There’s so much we can do to SUPPORT each other and our health! So, in honor of fighting cancer and all things PINK, I’m going to thrown in some red/orange and brighten up this PINK month even more! Persimmon combined with the very nutrient dense and anti-inflammatory rich Butternut Squash makes one CANCER FIGHTING POWER COMBO! From now on, this Persimmon Butternut Squash Soup will also be known as “FOOD of the CANCER FIGHTING Gods!” . A few persimmon picking notes: There are two kinds of persimmon (that I know of). To avoid that bitter taste, pick persimmons that have more a tomato shape and flatter base. These are the FUYU kind and are non-astringent. Best eaten only when very ripe, usually peeled. First steam your squash in steamer or microwave until they are a little tender. About 60-90 seconds in microwave works. Next cut off tops from persimmon. Peel each if desired. I left mine on but it’s up to you for texture. 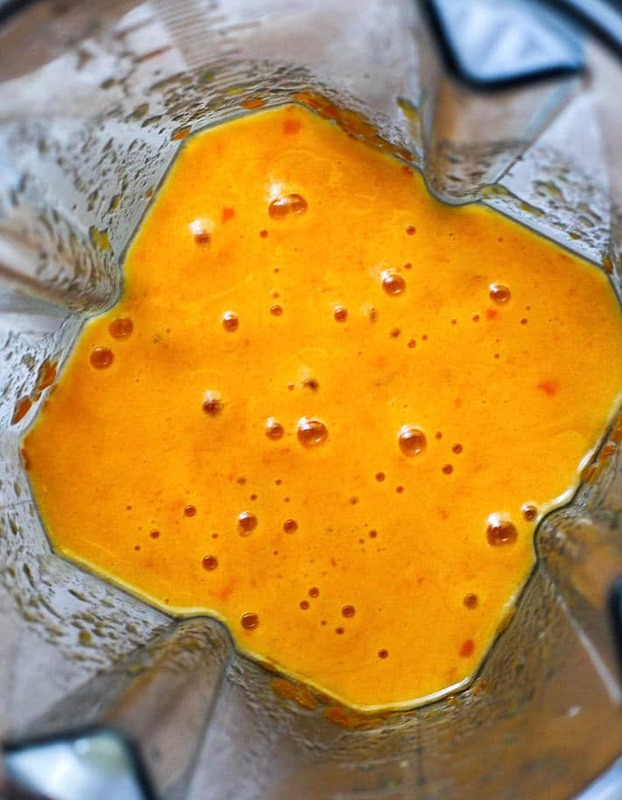 Combine persimmon, squash, and broth in a blender until smooth. Transfer to a medium size pot and add in your oil, coconut milk, almond butter, and maple syrup. Place on medium low and stir until smooth and everything is mixed thoroughly. Then add in your spices, stir, and simmer for 30 minutes. About 20 minutes into your simmer, the soup with thicken. Once it thickens, remove whole cloves (if you are using whole cloves) and place an emersion blender in the pot to blend again and make extra creamy and smooth. You can also just blend again or mix with spoon repeatedly. Taste and see if the seasoning is too your liking. It should be a little sweet but smokey. Serve and top with a dash of pepper, chili sauce, and toasted nuts if you’d like. To make it more cheesy versus smokey, just add in 1-2 tbsp nutritional yeast. Are you feeling warm and cozy yet? Good! My Monday goal is accomplished! What powerful immunity boosting foods are you adding to your diet this month? Thank you for calling out my post! And this is so creative. Persimmon is a beautiful fruit, but most people don’t know what to do with it beyond eating it as is. 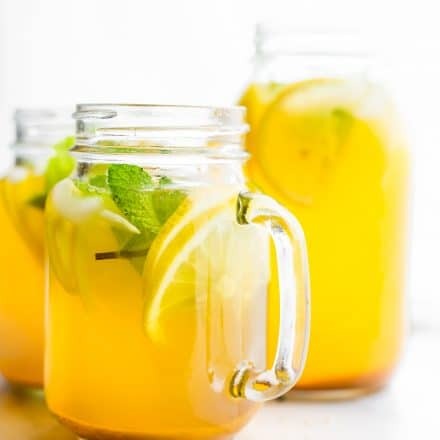 I love that you blended it with bnut squash to give it even more complexity and immune boosting power! Just had my 1st sub 30 degree run but already I’m feeling warm looking at this soup! This will be made! MMMMM I haven’t had a persimmon since last year–it’s about time I hope on board again. Probably in soup form since the weather here is all sorts of cold warm cold. Wow! I had no idea these were a fruit. Are tomatoes technically a fruit too? I’m actually corny too and love Mondays for their fresh start. Mmmmmm, I love persimmons, squash, creamy soup and fighting breast cancer. I had no clue Persimmons contained Fisetin which was so good for us! Lindsay, I cannot stand Mondays – but your nuggets of info make my Mondays better – so, I salute you and your delicious, totally unique and creative soup! I absolutely ADORE persimmons! They are so delicious and I have a whole bunch of them at home right now. Never thought to actually use it as an ingredient in recipes but totally intrigued by this! We have a persimmon tree in our back yard. I think this needs to go on my list! okay I”m coming to visit! I love it! 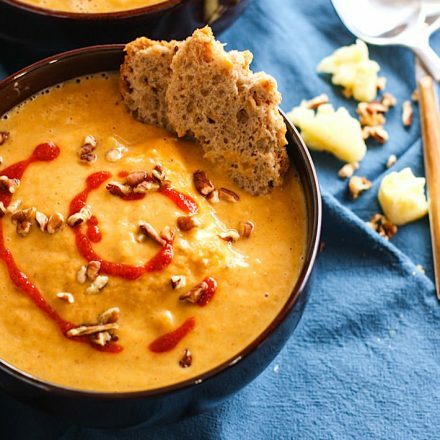 I never would have thought to add persimmons to bns soup, and it makes complete sense!! I bet this turns out soooo creamy with such nice sweet, warm flavor. I want a big bowl of this asap! I really hope my grocery store has persimmons because I desperately need to try them!! This soup looks so good. And I love that it is made quick on the stove top. And now that I have a BA blender, I can actually make this! Pinning for later. Can’t wait! well they are probably immunity boosting then and you are ONE HEALTHY woman! so keep it up! I ate a lot of persimmon (persimmons?) growing up – they’re huge in Asia, I think! I’ve never had it as a part of a meal though. Looks fantastic, my friend! I just made butternut squash soup yesterday! I must say, I’ve never tried a persimmon, which is odd, because I am usually always down to try a food once. This soup might be my first experience. And I’m love camu camu powder for immunity! I did not know that about persimmons! Seriously, best idea ever! I would have never thought to use persimmons and butternut together! Love this. Need to immunity after playing with sick babies in FLA. Good times. Yum, I love butternut soup! The addition of persimmon is so creative – and I love the breast cancer fighting and immunity boosting powers! Ya buddy! I knew you’d love that health perk Laura! Hooray for persimmons and fighting breast cancer!! What a fantastic reason to eat more this winter. I have to admit, I don’t remember seeing these in the grocery store, but I bet they have them at Whole Foods! I will be sure to pick out the ones that look like tomatoes 🙂 Thanks for the tip Lindsay! 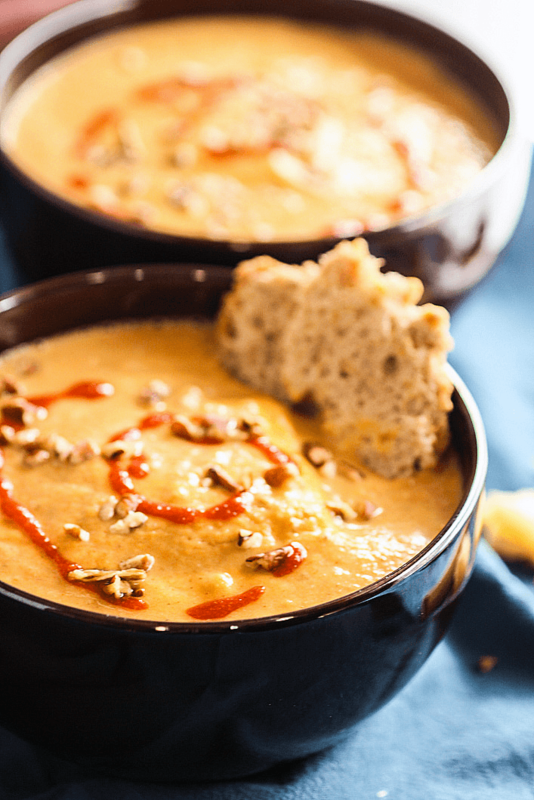 Any kind of butternut squash soup is usually right up my alley, so this sounds delish! yes, they are at whole foods! that’s where i got them. YAY! FOOD of the CANCER FIGHTING Gods: now that has a ring to it. I love it, almost as much as this beautiful soup made with Fall’s bounty. You’ve got another winner. Keep up the self care. Blows kiss, sends hug. It is soup season right now! So this sounds so perfect to me! Genius! I would have never thought to add persimmon to squash, apples and cranberries I have but never persimmon. Pinning for later, can’t wait to try this! Oh my gosh I love persimmons! This sounds so good! 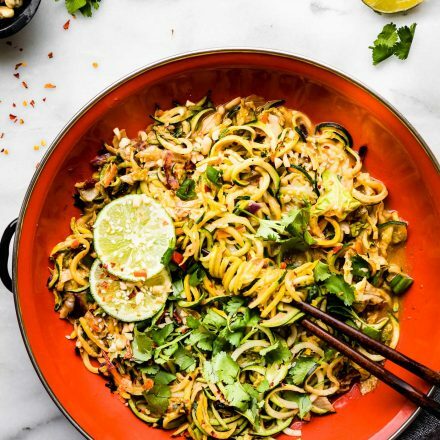 Am obsessed with this recipe! Love the combination of squash + fruit. 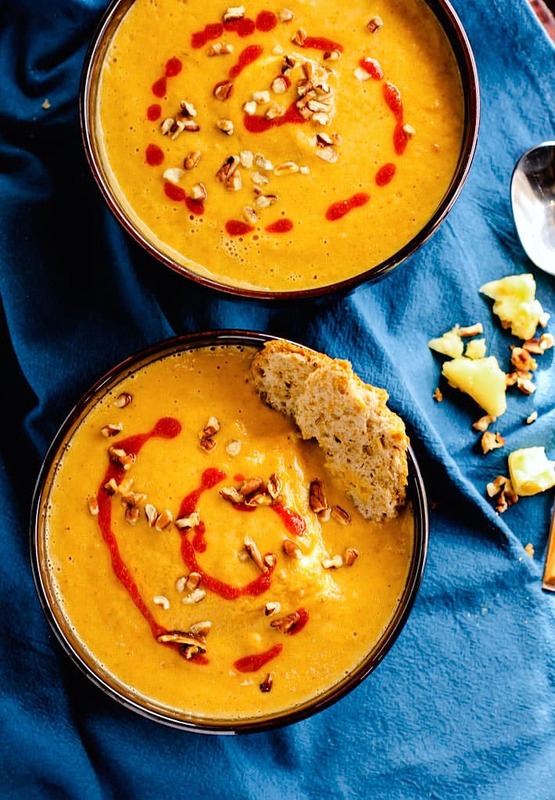 Last year I made a sweet potato apple soup that I loved, so am definitely feeling the whole fruit addition to fall themed soups! Don’t see enough persimmon recipes floating around even though they are so good. In my family (I don’t know maybe this is a Russian thing) we would wait until they were super super ripe, then freeze them for a bit and eat them slightly frozen – so cool and refreshing in the summer time! that’s genius! yes,i always wait till they are super ripe! but freezing them to eat would be bliss! Oh man, this looks and sounds fantastic. What if I can’t get persimmon’s Lindsay? Are normal tomatoes a bad substitute? good question! Tomatoes are different taste but same texture. You could try it! Maybe leave out the maple syrup? crazy but glad you finally tried! yay! well now you have a good excuse to try, right?! woohoo! now you can buy them! What an interesting flavor combo! I love both butternut squash + persimmons + of course – all of their health promoting properties. I can’t wait to try this soup! Super interesting!! 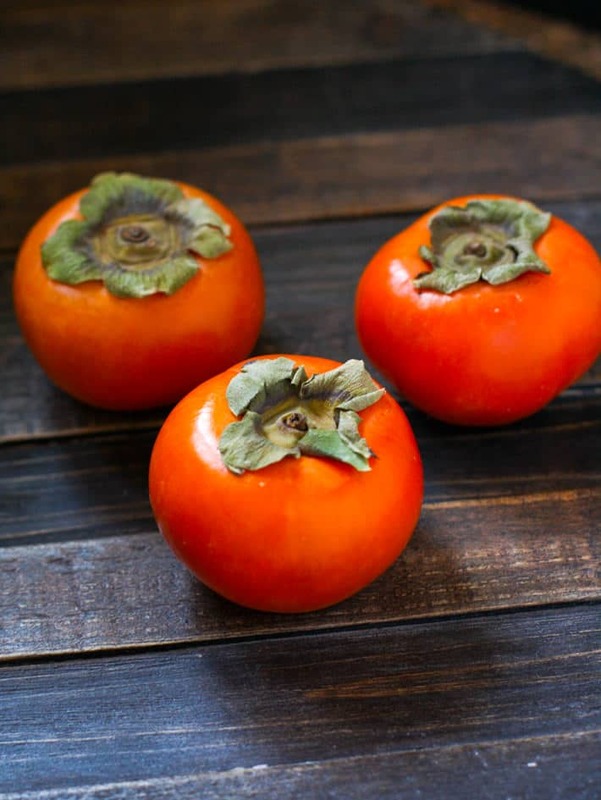 Persimmons are definitely an acquired taste – one that I’ve grown to love. The only time I’ve had a Persimmon is at a Sushi Restaurant as a dessert. They squeezed lemon over them and wow were they yummy. I love trying new fruits and if they are high in nutritional value then even better. My family and I love soup– we just received a huge butternut squash which I cubed up and froze for soup. Another amazing dish Linds. This soup sounds perfect! I love persimmons, one year I loved them soft and really ripe, the next I loved them hard and crunchy! Just like my changing opinion on when pears should be eaten! haha! Sadly persimmons aren’t great here in Australia but maybe its just the wrong season… will try again in a few months! they are so hit or miss! maybe you should come visit me for a good one, yes? This sounds so perfect for a (Chicago, probably not Texas, ha!) Fall evening. Everything about it sounds and looks so romantic; I bet the flavors are so amazing together! Can you believe I’ve never actually had a persimmon!? This may just have convinced me to pick some up! 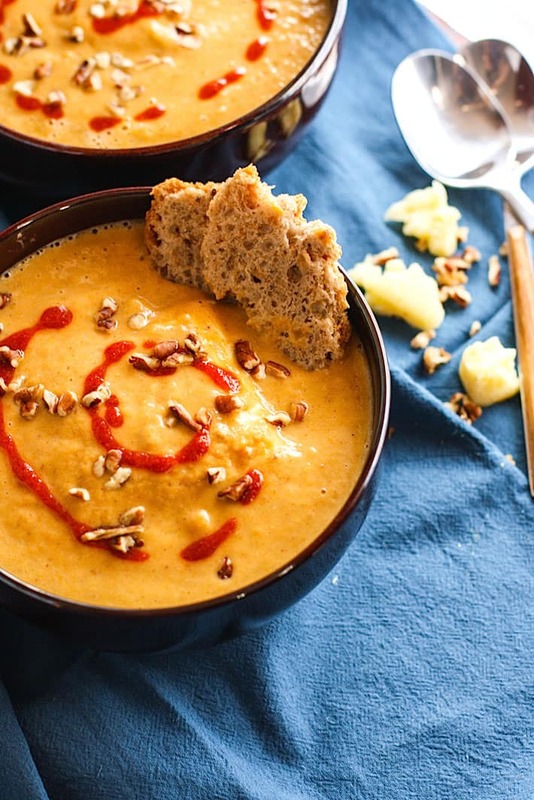 I LOVE butternut squash soup and this looks delightful! Oh you must! you’d love! I want to try this! We have both Fuyu and Hachiya persimmons. We just harvested our Hachiya tree. Would the very ripe and sweet Hachiya work just as well as the Fuyu? Or would you recommend sticking with Fuyu? Morning from sunny South Africa! Just wanted to add a little something – unripe persimmons – yes they don’t taste nice but add to smoothies or sweeten with natural sweetener – can be grated and the juice squeezed out and are used to kill internal body parasites and worms in many cultures. 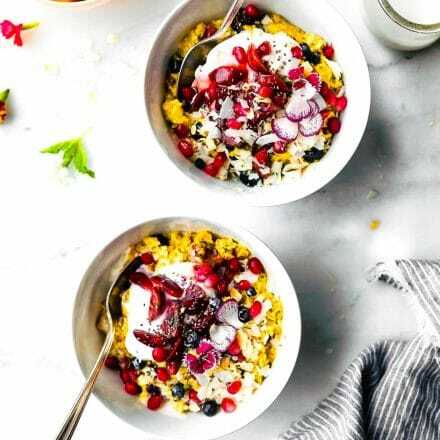 You take it – either the grated(better) or the juice every morning on an empty stomach (if possible haahaa) for a month or 2. Cant wait to try your soup!!! I am in the process of making the persimmon butternut squash soup. I roasted the squash first and then followed your recipe; however I did not know what your meant by “3 cloves” so did not add. I was afraid I would not like it too smokey so cut the smoked paprika to 1/2 tsp but added apx. 1/4 tsp cinnamon and a dash of ginger. Tastes to my liking. Also want you to know I have made your red pepper & shrimp soup several times and both I and my husband like it. I add a little more shrimp for protein and cut them into bite size pieces. Thanks for your recipes. Oh thank you Jenny! I will go update that recipe and specify the cloves. Sorry about that. But glad the other soups have turned out well! Keep me posted on any others you try. Do you think I could double the recipe, and use two cups of pumpkin along with 2 cups of butternut squash? I only have one small butternut squash and need to feed 7 adults. Would love your thoughts! Thanks! I think that would work! I would test out the mix and then adjust the spices as needed with cooking. If it’s too thick, you could add more broth or coconut milk. Tbh I expected something special that would make squash edible but it wasnt it. Persimmon made it even sweeter and didnt balance the squash at all. If you are not die hard pumpkin fan, dont try it. Oh no! Did you get a bad persimmon or squash? Maybe that was why. This is a favorite soup liked by my readers. I’m wondering what went wrong. So sorry!